eCommerce has taken rapidly over the traditional customer & salesman model. This not only has helped consumers to purchase without extra noise but has provided retailers with a time & cost effective space and tools with the flexibility to reach and speak to their customer in a wide variety of ways. Education, computers & electronics, wholesale, fashion, lifestyle & home — these are just some of the industries that you’ve heard to break the classical barrier and step into the digital advantages of the eCommerce world. So what about the automotive industry? For decades automotive companies have faced a challenge providing customers with a consistent and persuasive brand experience from the first contact to post-sale service. Nevertheless, this has been challenged by sophisticated business processes to achieve optimum interaction with dealerships, service centers, suppliers. Who has been the key person? Salesman. They’ve grown and polished their skills alongside the industry with clever wordplay, feeling customers welcomed, working with them towards sealing the deal. However, a year ago Scandiweb was approached by Rockar with an idea to disrupt the customer-salesman model and bring the Automotive industry to a new era. Becoming the first brand in the world to offer full digitalisation of a vehicle purchase and related services. 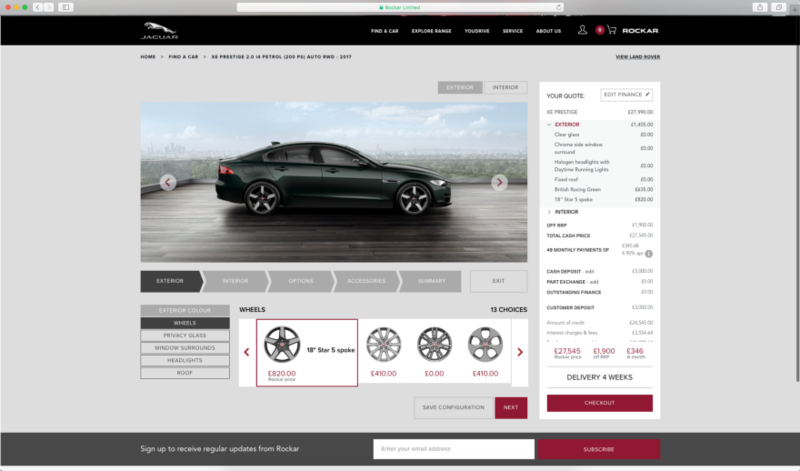 … Full configurator, Part Exchange (Trade-in), On-the-go Finance Calculations with Application Approval, Digital Documentation Cycle, Test Drive Booking and Service Requests adapted for web and in-store experience. Connect the customer directly to the product — take out the salesman. Add transparency — no hidden information. Make the journey convenient — few clicks, couple of minutes to buy a new vehicle configured to your liking. How come the front-end experience is better then on my Magento eBusiness? 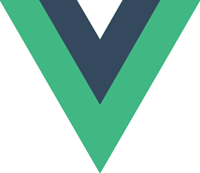 Rather than any other alternative It’s designed to be a view layer that is simple and flexible. What makes the Find A Car page so special? The Rockar platform has given the so-called Product List page a new look. It’s not just about simply listing down whatever a retailer has for sale. It’s finding the shortest path from single source to single destination within eCommerce helping your customers find what they want, how they want it, removing the complexity and waste of time. Financing options — what are they? In a classical scenario, the price of a car would be played around until the Salesman would get his percentage out of it naming a few numbers here and there leaving a customer pretty much out in the dark. With the Rockar platform, we’ve built the Finance to align to any selection during the journey. Do you prefer to have a Personal Contract Purchase (PCP), Hire purchase (HP), Personal Contract Hire (PCH) agreement or you just found the ideal car for your business? Perhaps you just want to buy the vehicle in Cash? Simply pick your preference from the many options and choose the term, mileage, deposit as well as how much you want to pay each month. No more wordplay and uncertain digits. Have a straight answer right away as you make your finance selection. Without any doubt, finance is one of the most if not the most crucial part within the Rockar platform. Our Scandiweb Business analysts put a lot of effort into analysis and architecture before going into actual development with every component, especially finance. The key element was to provide a flexible and adaptable functionality, which would not only allow the Front-end user to play around with their selection but also give the admin the option to adjust calculations, naming and other factors without any developer support. Each Finance option (e.g. 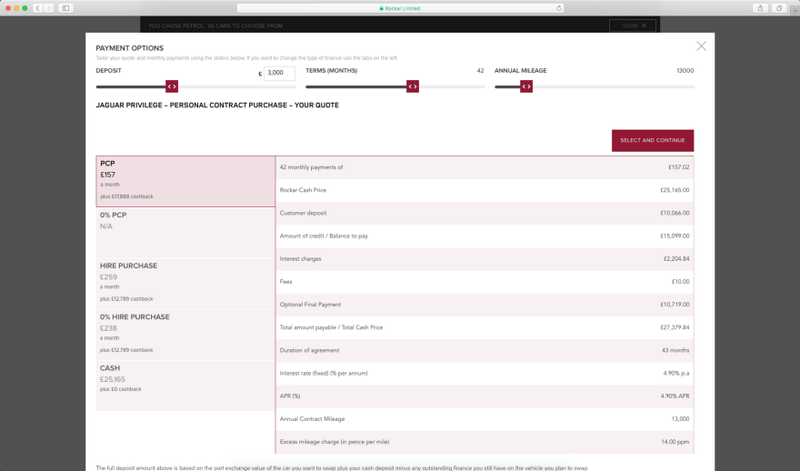 Personal contract purchase, Hire purchase) is built around It’s own specific parameters, combined with it’s own data feed and calculations, rates, additional finance data and front-end content. Who calculates and imports all of the Finance Data? In order to ensure performance and remove the human error factor, we’ve created an independent solution based on Laravel that does all the calculation and put’s the Finance Data together in a structure that can be synced with the Rockar Platform rather then manual entry. Also, this allows quicker maintenance and development support. We would be lying if we said we didn’t have any. One of the biggest ones — payment summary update. Currently, there are more than 150 scenarios cover practically any front-end selection in result triggering dynamical Finance and Payment summary updates. In result, the customer sees information according to what he selects. Want to trade-in your old car as part of buying a new one? Rockar has it covered. No more low-balling your trade-in. You’ll see how much your vehicle is worth within a few seconds. Within the platform we’ve integrated the UK’s CAP Service and DVLA to find your exact car. Combining both gives us the information on the vehicle that you’ve entered either by the plate number or by the manual selection of their exact vehicle by model, release year and other specifics. In addition, we’ll also compare and show the running cost difference for each of the vehicles available so you know whether it will be more or less to run. How many parameters does a usual eCommerce product have? 2…, 3…, 10? What about 200 and even more? If you’re selling t-shirts — size, colour perhaps even fabric are your key parameter. With cars, It’s a whole nother story. Just try to guess how many parameters does an engine have? Exactly! It can be a 100, 100 000 or more. Our developer team took great care in analysis and product structure in order to not only benefit from the functionality and visual perspective but also site performance, which is key at all times. So you’ve found your dream car and now It’s time to make sure It’s the right one? Have you ever wondered how long does it take to build a car? Every option, trim, even colour requires a specific time for the manufacturer to put it all together into a car. Together with Rockar we managed to find the recipe to tell you what this exact time is. It's called Lead time. See a few premium colours of your liking, but time is of the essence and you can’t wait 4 weeks. No problem. 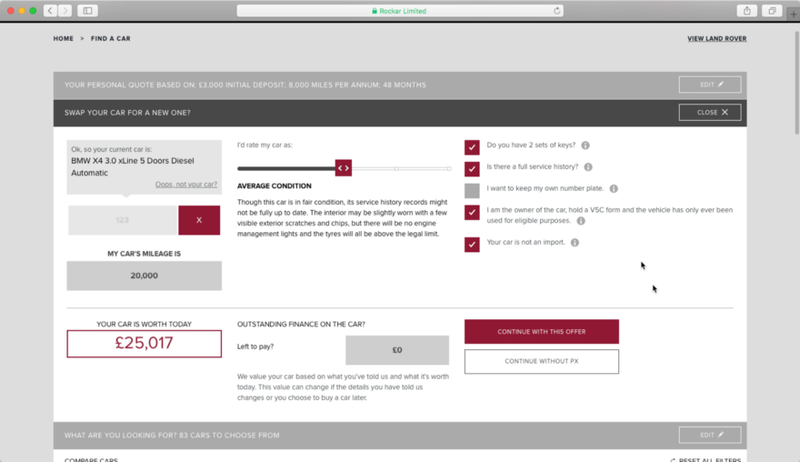 Have an alternative to choose from with a single click and see when you’ll have your new car delivered to your home. Not sure about the purchase? Simply book a test drive through YouDrive from the location closest and most convenient to you. No more long confusing calls, verifications and wait time. YouDrive is a great booking tool that gives you the power to choose the car, model, date & time and location at their fingertips. 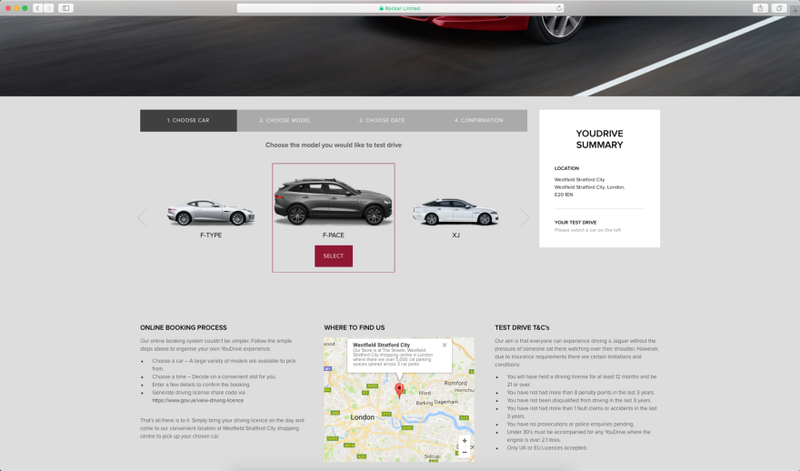 Use it from It’s one YouDrive section on the site or by simply choosing any car and booking the order from the Car Configurator page. So you’ve looked through all the cars, all the pre-configued options. Still, can’t find the car that has the right colour, perhaps the right trim? Even Tesla might be jealous. 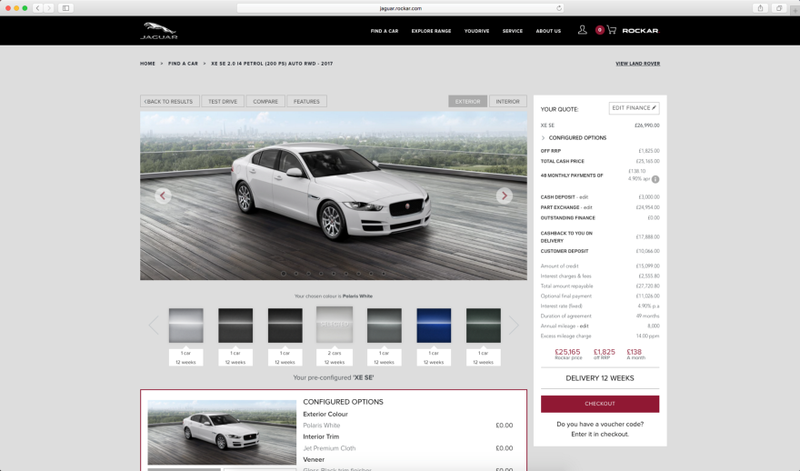 Now Jaguar and Land Rover fans can craft their own bespoke car and explore the premium options while seeing the price and delivery time instantly adapt to their selection. Fill in Checkout again? Is their a way to save my progress? A car purchase is not a spontaneous decision. Don’t rush it. Just pick-up your checkout journey from the comfort of your home, car or wherever life might take you. 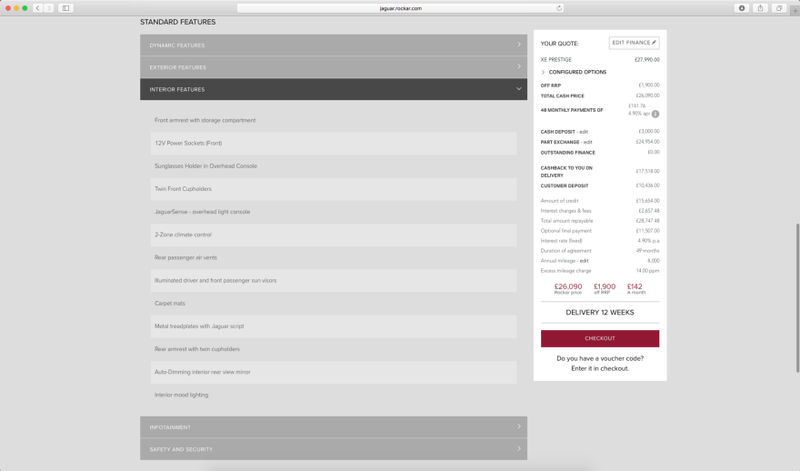 We’ve built the Checkout so that any user can simply fill in as much detail and continue at any point. You might be at the store or simply browsing from your phone. Don’t worry. Just log in and continue. Can I still change my finance option? 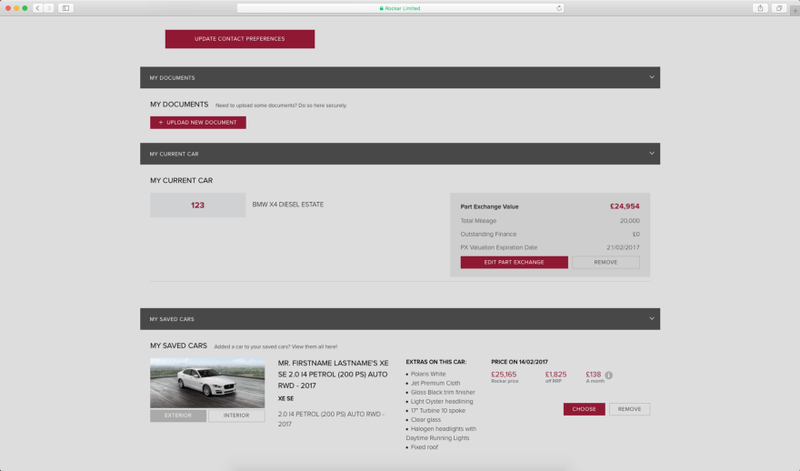 the Find A Car page with its Finance Filter or Finance Overlay. 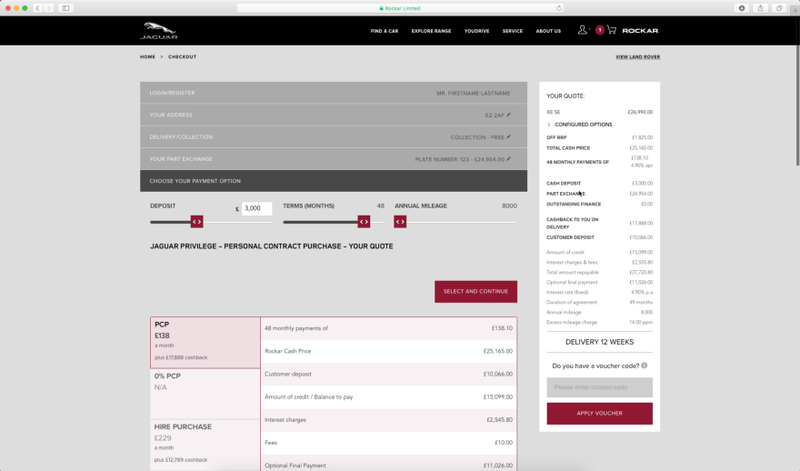 or Car Configurator Finance Quote and It’s own Finance Overlay. 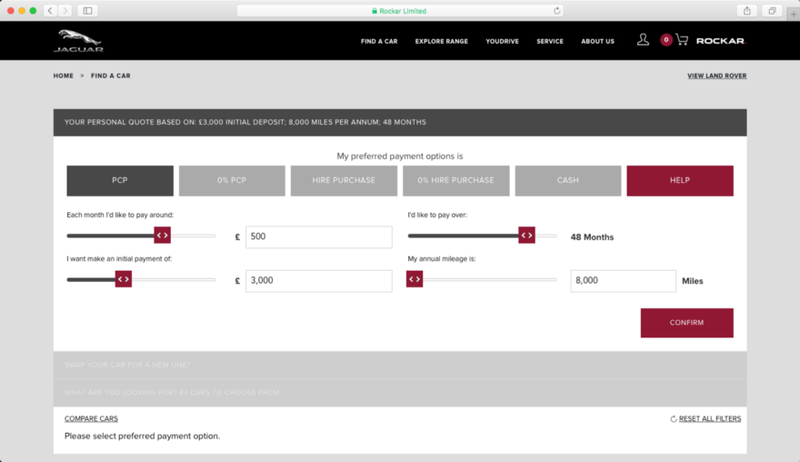 You can change your finance option also on the Checkout and you’ll be presented with the exact calculation on the fly at all times. I need send over some documents for verification. Where can I do that? More than ever, the Rockar platform delivers a fully digitalized purchase, trading in and financing document workflow. You can get your car delivered to your doorstep, while you are on the road or vacation. Placed an order, but not sure what to do next? The Next Steps functionality will provide you with the information required and what’s needed from you. Ever wondered, if you’re car is being built or It’s already arrived? 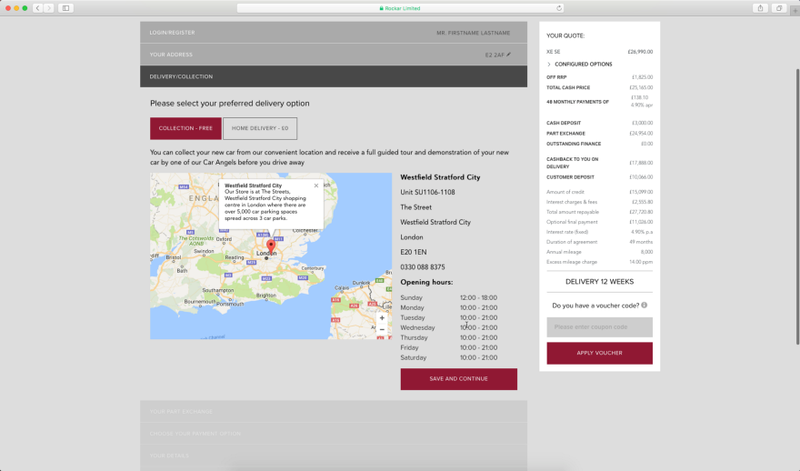 Starting from placing your order you’ll be able to see through every step until the car will be delivered. Found a car that you want to save for later? No problem. Save the car with your specific Finance option and review it later — today, tomorrow or even in a week. If you’re taken your time and you’re ready to proceed with the purchase. Why search again? Go to My Saved Cars and find your can there and continue the checkout process from there. Physical stores are evolving to become bespoke showrooms that feature merchandise to be felt, touched and tried on, but ordered online. How does this come together with the Rockar platform? We’ve covered both — in-store touch devices that present the same information as the website. Still, one might ask, how can a customer physically purchase from a website. We’ve found the answer by having the in-store devices adapt to sites functionality and become the most powerful and only tool of value that store staff need. Is this the biggest Magento beast out there? Possibly and It’s well protected. We’ve applied more than 500+ (and counting) unit tests that keep this dynamic evolving application intact protecting from any dependency failure at all times. On top of that, we’ve put a Test Automation Suite that makes sure that we’re covered at all times, whether a new feature or enhancement is introduced. Are you ready to innovate and disrupt your own industry? Let us know. We’ll help you bring an idea into an actual business!